Walk along the waterside promenade, watch people dancing and get to know local inhabitants. Often it are the small things that make your day special. 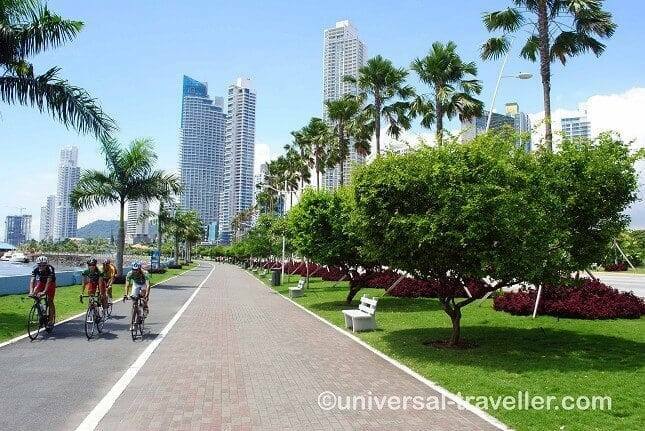 The waterside promenade in Panama City is a lively place and connects downtown with the old city of Panama. It is predestinated for walks and a good place to relax and meet up with friends. At the end of the promenade is the fishmarket of Panama city situated. You can smell it already from far away but you should still go. It is an interesting place and for small money you can get a really good lunch. I recommend to try Cerviche. While walking along the waterside promenade you will see many groups of people dancing or doing sports together. Take some time watching them and enjoy the nice atmosphere. Maybe you have the chance to speak to some local people. Mostly it are the small things that make your trip special. Casca Viejo is the old City of Panama City and is since 2003 a UNESCO World Cultural Heritage Side. In a relatively small area there are many places of interest like Plaza de Francia, Plaza de la Independencia, San Francisco Church, National Theater, Panama Canal Museum, the Metropolitan Cathedral and many typical houses. I recommend to rent a bike, it is not for free but pretty cheap and probably the best way to discover Casco Viejo. Go out of your hotel and enjoy Panama City by night. From the waterside promenade you can see many illuminated buildings. The people in Panama city are friendly and just wonderful. Not least because of them Panama is one of my favourite cities. On the waterside promenade I have met this group of people. They are students and had the wonderful idea to give away free hugs. Day trips from Panama City.